Envy leads Ed and Al, who has sneaked May in his armor, out of Father’s hideout, which is actually under military HQ, to meet with Bradley. 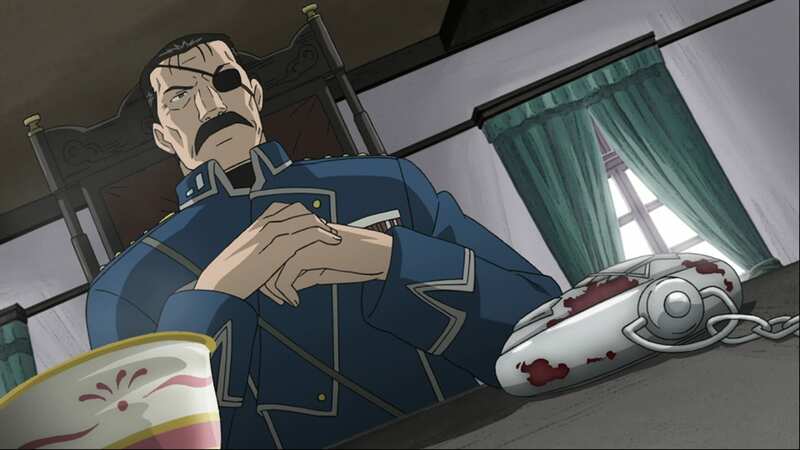 Ed threatens to quit the military, but Bradley says he will kill Winry if he does. However, he allows Ed and Al to continue their research. Roy enquires if Bradley was the one who killed Hughes, which he wasn’t. After checking Winry is alright, Ed and Al encounter Greed, who gives them a message to Lan Fan from Lin. Meeting up with Bradley, Greed points out that Lin is still fighting for control. Roy reveals Bradley’s identity to Armstrong, and ponders that there may be another homunculus hidden in the shadows. Al passes on Lin’s message to Lan Fan, as well as telling her about him and Greed, encouraging her to get an automail arm. Ed, hearing that other alchemists alchemy had failed the same time as his and Al’s, wonders how Scar and May’s alchemy works. Meanwhile, as Father creates a new copy of Gluttony, Scar encounters Marcoh in their prison, who begs him to kill him so the homunculus cannot use him for their plans. However, Scar demands to hear more about the Ishbalan war from him.